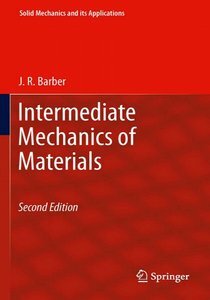 J. R. Barber, "Intermediate Mechanics of Materials, 2 Edition"
This book covers the essential topics for a second-level course in strength of materials or mechanics of materials, with an emphasis on techniques that are useful for mechanical design. Design typically involves an initial conceptual stage during which many options are considered. At this stage, quick approximate analytical methods are crucial in determining which of the initial proposals are feasible. The ideal would be to get within 30% with a few lines of calculation. The designer also needs to develop experience as to the kinds of features in the geometry or the loading that are most likely to lead to critical conditions. With this in mind, the author tries wherever possible to give a physical and even an intuitive interpretation to the problems under investigation. 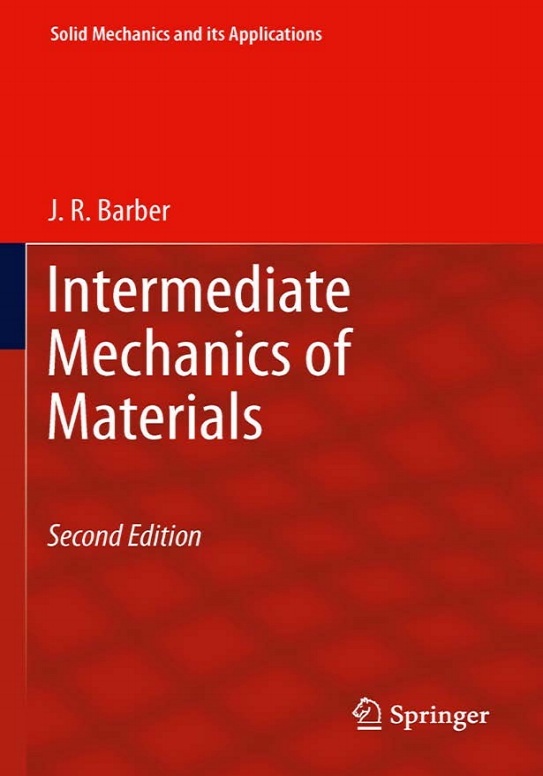 For example, students are encouraged to estimate the location of weak and strong bending axes and the resulting neutral axis of bending before performing calculations, and the author discusses ways of getting good accuracy with a simple one degree of freedom Rayleigh-Ritz approximation. Students are also encouraged to develop a feeling for structural deformation by performing simple experiments in their outside environment, such as estimating the radius to which an initially straight bar can be bent without producing permanent deformation, or convincing themselves of the dramatic difference between torsional and bending stiffness for a thin-walled open beam section by trying to bend and then twist a structural steel beam by hand-applied loads at one end. In choosing dimensions for mechanical components, designers will expect to be guided by criteria of minimum weight, which with elementary calculations, generally leads to a thin-walled structure as an optimal solution. This consideration motivates the emphasis on thin-walled structures, but also demands that students be introduced to the limits imposed by structural instability. Emphasis is also placed on the effect of manufacturing errors on such highly-designed structures - for example, the effect of load misalignment on a beam with a large ratio between principal stiffness and the large magnification of initial alignment or loading errors in a strut below, but not too far below the buckling load.